1 Pkg. Betty Crocker reduced Fat yellow cake mix. 1 Cup drained crushed pineapple. Coat three nine inch round cake pans with nonstick cooking spray and dust with flour. Mix on low speed wintil well combined. Pour into the prepared pans, trying to pour even amounts in each pan. Bake for 20-25 minutes or until a toothpick inserted comes out clean. In a mixing bowl, blend together the cream cheese and margarine. Gradually add the powdered sugar, mixing until smooth and creamy. Note: I served this at a get together recently, just a summer cookout with friends and family, and everyone loved it! Join in and write your own page! It's easy to do. How? 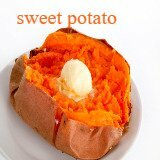 Simply click here to return to Sweet Potato Recipes.